Purpose: The purpose of this study was to evaluate the remineralizing efficacy of self-assembling peptide (SAP) P11-4 qualitatively and quantitatively using scanning electron microscopy (SEM) and energy-dispersive X-ray (EDX), respectively. Methodology: Enamel samples (n = 24) were prepared by sectioning extracted premolars and subjected for demineralization to create artificial enamel lesions. The structural and elemental concentrations (calcium and phosphate weight %) were assessed to obtain baseline data using SEM and EDX spectroscopy, respectively. The samples were randomly allocated into two groups and were treated with SAP P11-4 (test group) and casein phosphopeptides-amorphous calcium phosphate (CPP-ACP) (control group) followed by storage in artificial saliva to evaluate the remineralizing efficacy at 1-week, 1-month, and 3-month intervals. 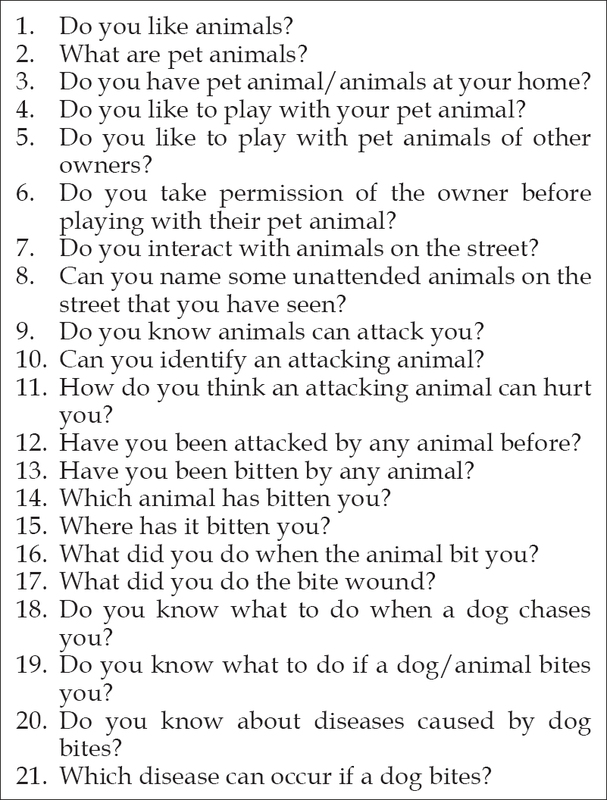 Results: Data were analyzed using the ANOVA and unpaired t-test. From the observed results, CPP-ACP showed a significant increase in Ca: P ratio (2.04 ± 0.2) with irregular surface calcific deposition at 1-week interval and this reduced with time (1.87 ± 0.11 at 3-month interval). 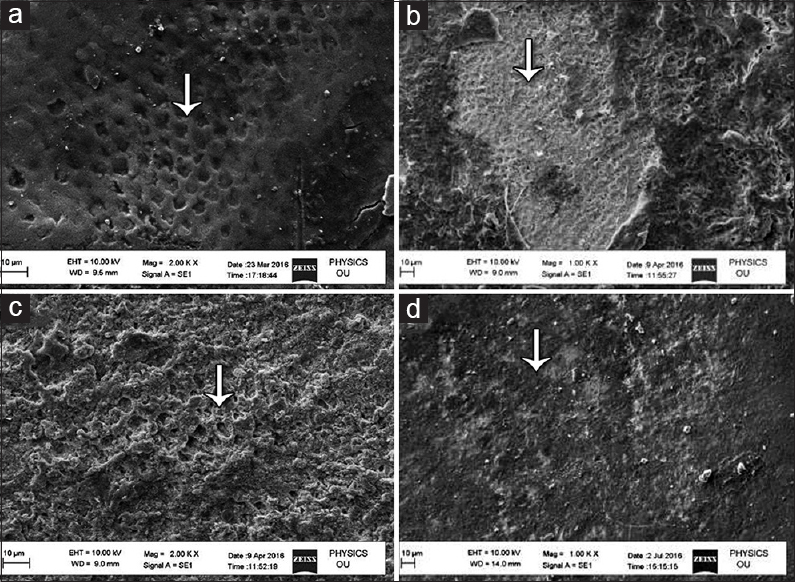 Whereas P11-4 showed a significant increase in Ca: P ratio (1.95 ± 0.10) with uniform ion deposition suggestive of hydroxyapatite nucleation over a 3-month period. Conclusion: SAP P11-4 exhibited superior remineralization with uniform mineral deposition compared to CPP-ACP at 3-month interval. Purpose: Nutrition has a great impact on children's health. Of great concern are the underweight children because of the risk of illness and mortality in them. Being overweight can also have long-lasting adverse effect on development of the child. 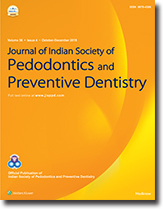 The purpose of this study was to determine body mass index (BMI) and dental development in normal and underweight children and to carry out a correlative analysis of calculated dental age, chronological age, and BMI in normal and underweight children of age group of 6–13 years of Navi Mumbai, India. Materials and Methods: The sample for the study consisted of 301 participants, that is, 171 boys and 130 girls who were divided into two groups, namely, normal and underweight. Results: When BMI was less than normal, calculated dental age was less and thus the dental development was retarded and vice versa. Conclusion: The following conclusions were drawn from the study: (1) a significant positive correlation was found between chronological age and dental age and (2) along with the chronological age and dental age, the calculated dental age difference must also be taken into consideration. Introduction: Cerebral palsy (CP) is a neurological disability the exact cause of which is not known. Exposure to toxic elements, environmental pollutants, and various teratogens such as lead, either prenatal or postnatal, can be a risk factor for this neurologic disability. CP children have poor neuromuscular coordination, exposing them to increased risk of oral diseases such as drooling of saliva, periodontal diseases, dental caries, and malocclusion. There are less studies comparing lead concentration in CP children, as it can be one of the contributing factors to dental caries. 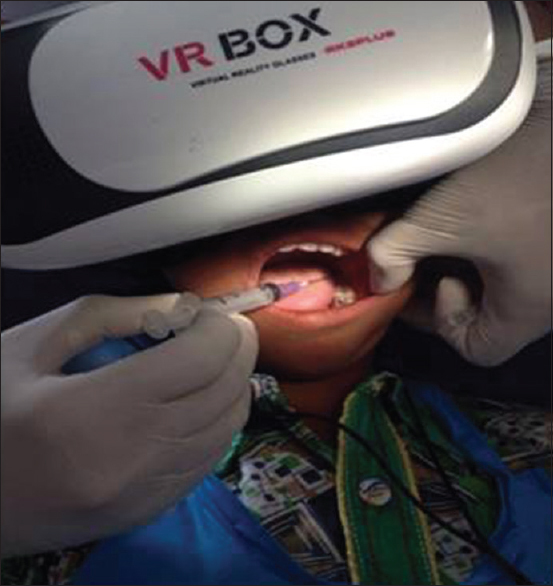 Aims and Objectives: The present study was to estimate and compare the salivary lead level in normal and neurologically disabled children and to correlate salivary lead level with dental caries in both normal and neurologically disabled children. Materials and Methods: A study on 45 children reporting to CP rehabilitation center and 41 normal children taken from the Outpatient Department of the Pediatric and Preventive Dentistry. P.M.N.M. Dental College and Hospital, Bagalkot, Karnataka. All children were between the age group of 5–12 years. In all individuals, a thorough medical history and dental examination were done. The age, state of dentition, and the level of caries in all individuals were determined by the same examiner, and salivary lead concentrations were determined using atomic absorption spectrophotometer. All children were divided into four groups depending on the presence or absence of dental caries. Group 1 consisted of 20 normal children with dental caries, Group 2 consisted of 21 normal children without dental caries, Group 3 consisted of 25 CP children with dental caries, and Group 4 consisted of 20 CP children without dental caries. Results: Were recorded tabulated and statistically analyzed. 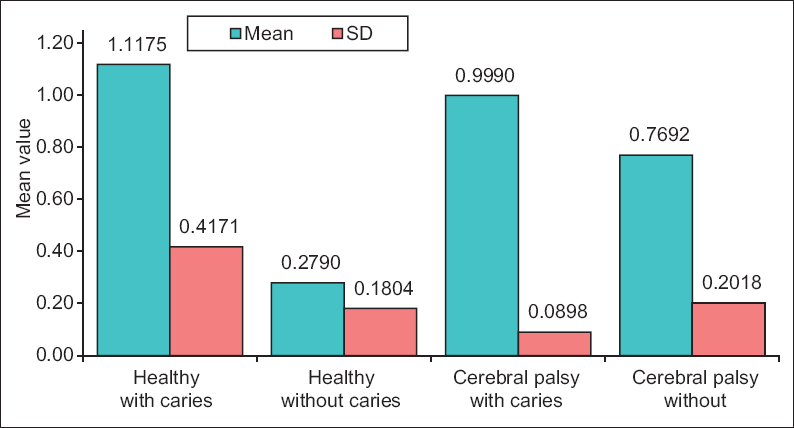 CP children had high decayed, missing, and filled teeth/def scores, dental caries, and salivary lead concentration as compared to normal children. Statistically significant correlation was obtained between the dental caries and saliva lead concentration. The lead concentration was directly proportional to the carious status. Conclusion: CP children are more prone to dental caries and increased salivary lead concentration which could be a cause as well as the effect of CP. 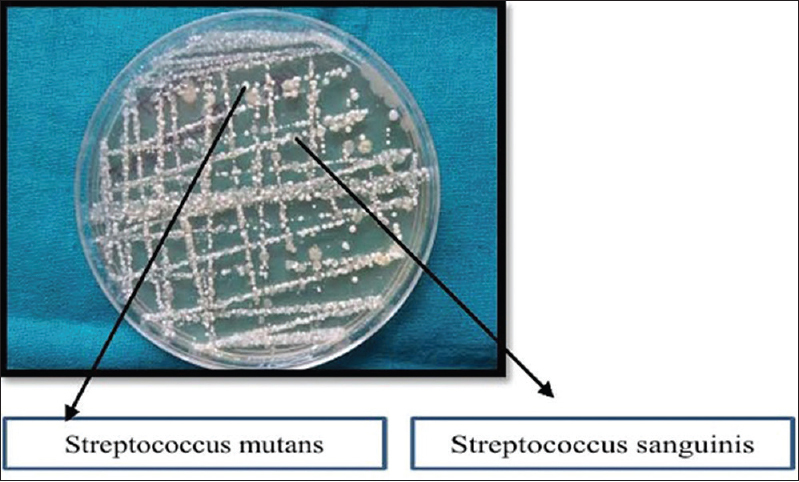 Background: Recent investigations have shown the possible involvement of bacteria other than mutans group and Lactobacilli in the etiology of caries. Molecular methods have been used to study the microbial diversity in caries-active (CA) and caries-free (CF) children. 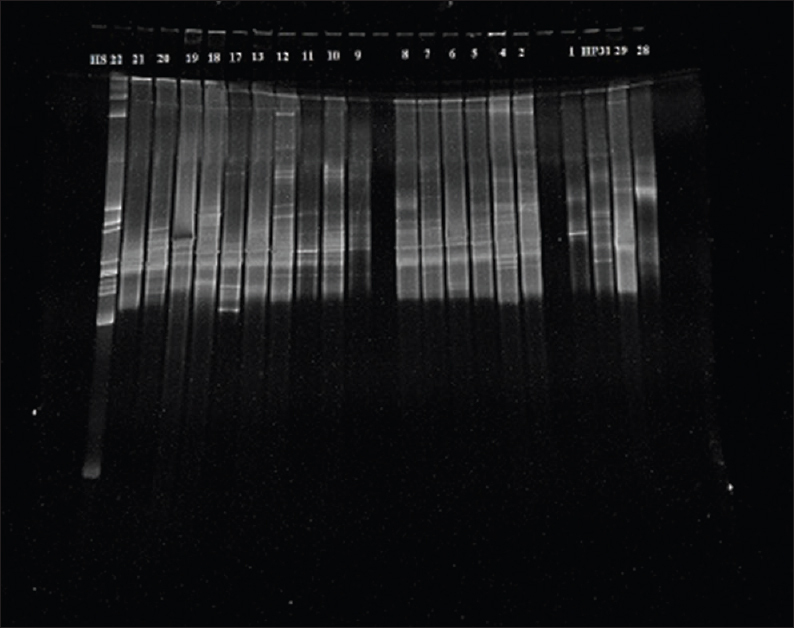 Among them, denaturing gradient gel electrophoresis (DGGE) is more popular and has been used in the present study. Aims: The aim of the present study was to investigate the difference in bacterial diversity in saliva and plaque samples from CF and CA children using DGGE. Materials and Methods: The study involved saliva and plaque samples from 56 children of which 28 were CF, 20 with CA, and 8 with white spot lesions (WSP). DNA was extracted and subjected to polymerase chain reaction amplification with universal primers. It was then run in polyacrylamide gel electrophoresis with gradients of urea and formamide and stained with SYBR green. Multiple bands were produced in each sample lane and each band represents one organism. Statistical Analysis: A dendrogram was generated using Phoretix software and similarity index was calculated using a specific formula. Results: Samples in each group formed several clusters indicating a specific pattern of the bacterial profile. Similarity coefficient was calculated based on the number of bands, intensity, and location. The diversity was less in the saliva and plaque samples of CA group as compared to those of CF and WSP groups. Conclusions: DGGE can be used to study distinctive bacterial profiles in healthy and caries-affected sites. DGGE can be further developed as a pattern recognition tool with which to identify specific groups of bacteria. Saliva may be used to study bacterial diversity in dental caries. Replantation of avulsed incisors in young children is a successful treatment modality. Almost all replanted teeth exhibit ankylosis followed by inflammatory or replacement resorption, as immediate replantation is practically rare. The purpose of the review is to report a series of cases of prolonged delay in replantation of avulsed incisors and discuss its sequelae, leading to different patterns of root resorption after a minimum follow-up period of 24 months. The present case series is a follow-up of five cases of delayed replantation (more than 24 h delay) without any root surface treatment. Extraoral endodontic therapy was performed before replantation. The avulsed teeth were stabilized using an acid-etch composite resin splint for 4 weeks. The patients were followed up at 3, 6, and 12 months interval and half-yearly thereafter, for examination of the replanted teeth clinically and radiographically. After 24-month follow-up, the replanted teeth were evaluated for gingival changes and clinical mobility. 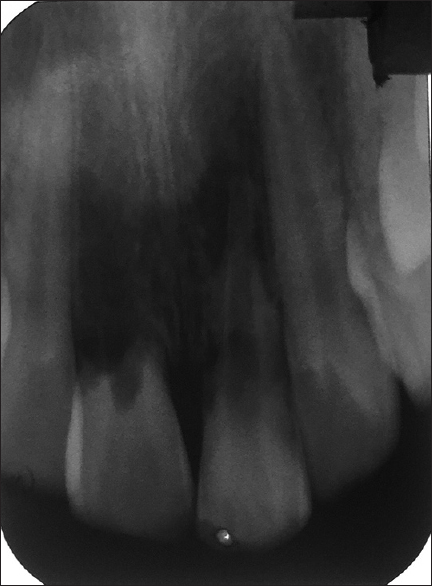 The radiographs were evaluated for external root resorption or inflammatory resorption, osseous root replacement, or replacement resorption. The case series concludes that avulsed teeth transported in dry as well as dessicated conditions and replanted after a delay of 24 h have a survival rate of more than 24 months, though there is no promising long-term prognosis. The sequelae in most of the cases are surface resorption followed by inflammatory resorption or resorption due to pulpal infection or replacement resorption.